Photo: Timothy Guidotti of Ferdotti Motor Services receiving the award from Lord MacLaurin, former CEO of Tesco and Vodafone. Ferdotti Motor Services Ltd, a family business based in West Bromwich, employs 14 people and was established more than 30 years ago and joined the FSG Masterserve network in 2006. West Bromwich-based Ferdotti Motor Services won the Going The Extra Mile award for the most compliments from customers and the FSG operations team as a percentage against a workload of almost 300 jobs in the past 12 months. Ferdotti received its award at FSG’s annual Masterserve Supplier Workshop in Chippenham, which attracted bosses from many of the businesses in the near 500-strong UK-wide Masterserve network of independent garages. 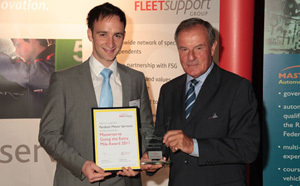 Fleet Support Group (FSG) is the largest independent vehicle management company in the UK and looks after approximately 55,000 vehicles.